Individuals preparing for this exam typically work in team settings where Visual Studio 2005 or Microsoft Visual Studio .NET 2003 Enterprise Developer is used. They also usually have a minimum of 2-3 years web and Windows-based experience developing applications by utilizing the .NET Frameworks 1.0 through 2.0. Likewise, they should understand how to use Visual Studio 2005. Rafiq Wayani - Rafiq has spent over 20 years in the IT industry as a Project Manager, DBA, Software Engineer, and Systems Architect. 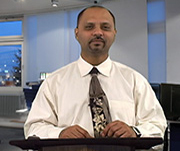 He has taught many technical classes and designed and setup information systems and computer networks. Rafiq is certified as a Master Netware Engineer, Novell Engineer and Netware Administrator, Trainer, Database Administrator, Application Developer, Systems Engineer, Microsoft Solutions Developer, and he is A+ Certified. Additionally, he is MCP, MCDBA, MCSE, MCT, and MCSD certified. What is a Reference Type? What's the Difference Between a Reference and Value Type?